The shoulder is lower than the travel lane. This condition is often created by a pavement overlay that is applied without an appropriate raising of the shoulder level. Another example is the unpaved shoulder that becomes significantly rutted or eroded away often because of the lack of proper maintenance. Elevation differences between or within paved lanes and shoulders. These are normally temporary conditions that occur during pavement overlay or milling operations. The roadside area is lower than the paved shoulder.This condition is similar to the others mentioned above except that it exists further from the edge of the travel lanes. When a vehicle strays from the travel lane onto the shoulder or roadside, the normal reaction of a driver is to return to the safe haven of the travel lane. The driver's urgency to make this return is usually heightened by the sudden drop when the shoulder or roadside elevation is significantly lower than the travel lane. 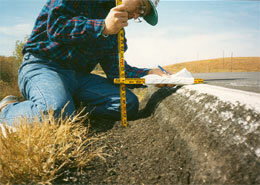 Research1-5 indicates pavement edge drop offs of 2 inches or even lower can cause vehicular loss of control. The major hazard comes from a low-angle departure from the traveled way followed by a low-angle return which causes the tires to scrub against the edge drop. When scrubbing occurs, the wheel develops a large resistance to mounting the pavement and the driver, who is attempting to recover the travel lane, will continue to increase the steering. This resistance continues until the front-wheel steer angle is sufficient to overcome the retarding force and to create enough side force at the unobstructed front tire to lift the obstructed (scrubbing) front tire over the edge drop off. Once the obstructed tire mounts the edge, the large steer angle produces the characteristic rapid movement (slingshot effect) across the travel lane. Although most of the research on pavement edge drop off hazard has focused on the vehicle dynamics related to a scrubbing re-entry, other accident situations are causally related to edge drop offs. Most clearly, vehicle rollovers can be caused by heavy undercarriage contact and/or other exaggerated vehicle instabilities related to edge drops of six inches or more. Then too, when drivers attempt to recover from a shoulder or roadside excursion, they will steer a circular path that requires lateral acceleration. If the radius of this path is relatively low for the vehicle speed, contact with a pavement edge drop off can trigger loss of control (much like hitting a large bump while steering a roadway curve). pavement ... All types of shoulders should be constructed and maintained flush with the paved surface if they are to fulfill the function for which they are intended... Aside from the inconvenience and car wear that may occur when a motorist drives onto an unstable shoulder, a definite hazard is associated with its use when driven upon at any appreciable speed. Skidding out of control or turning over are not uncommon accidents as a result of loose gravel, sandy, muddy, soft or spongy shoulders. Similar language is found in the 1954 AASHO Policy on Geometric Design of Rural Highways7, and under the topic, The Forgiving Roadside, in the 1974 AASHTO publication, Highway Design and Operational Practice Related to Highway Safety8. running speed of a road, the smaller the allowable tolerance in edge drop-off. Where possible, the contract should limit the amount of difference in elevation between adjacent lanes. The time that a difference in elevation will be allowed should be limited. Signs can be used to advise motorists of the drop-off condition. A fillet or wedge of gravel or paving material can be placed. Where excessive drop-offs are necessary, it may be possible to close the adjacent lane with appropriate channelizing devices. If the adjacent lane cannot be closed, it may be necessary to install longitudinal roadside barriers such as guardrail or portable concrete barriers. Pavement edge drop-offs may occur during highway work such as resurfacing or shoulder work. When not properly addressed, drop-offs may lead to an errant vehicle losing control with a high potential for a serious accident. relative location of on-coming traffic. Specify that no vertical drop-off greater than 3 inches in height, or 4.5 inches with a 45-degree or flatter slope, is to be left unprotected overnight. Place a wedge of material along the face of the drop-off. The wedge should consist of stable material placed at a 45-degree or flatter slope. Warning signs should be placed in advance and throughout the treatm ent. Pavement markings are useful in delineating the edge of the travel lane. Place channelizing devices along the traffic side of the hazard and maintain, if practical, a 3-foot wide buffer between the edge of the travel lane and the drop-off. . . . Warning signs should be placed in advance and throughout the treatment. Install portable concrete barriers or other acceptable positive barriers with a buffer between the barrier face and the traveled way. In the early to mid-1980's, many state highway agencies adopted a 3-inch pavement edge height as a maximum tolerable level, based on the report, Pavement Edges and Vehicle Stability - A Basis for Maintenance Guidelines12, by Zimmer and Ivey and on other publications (e.g. The Roadside Design Guide11) that had adopted the recommendations of that study. Later research, however, both has disputed the Zimmer and Ivey results and has provided general guidelines that suggest that a 2-inch criterion is a more appropriate maximum for 55-mph highways. One of these later reports, prepared in response to a mandate by the U.S. Congress, was titled Pavement Edge Drop1 by Olson, Zimmer and Pezoldt. Based on this later work, the Federal Highway Administration and many state highway agencies now have a 1.5- to 2-inch edge height criterion for both routine maintenance and for unprotected pavement edge drops in construction zones. To date, no physical research has been undertaken to address the deleterious effects of pavement edge drop offs for the 70-75 mph speeds of current Interstate highways. The only research of any kind to address speeds higher than 55 mph has been the analytical work by Graham and Glennon2, which suggests a maximum tolerable edge drop of one inch for vertical edges and two inches for rounded edges. These recommendations desirably should be validated with full-scale physical tests. 1. P. L. Olson, R. A. Zimmer and V. Pezoldt, "Pavement Edge Drop," Transportation Research Board, 1986. Available from www.criterionpress.com. 2. J. L. Graham and John C. Glennon, "Work Zone Design Considerations for Truck Operations and Pavement/Shoulder Drop-Offs," Federal Highway Administration, 1984. 3. John C. Glennon, "Effect of Pavement/Shoulder Drop-Offs on Highway Safety: A Synthesis of Prior Research," Transportation Research Board,1985. Available from www.criterionpress.com. 4. Transportation Research Board, "Designing Safer Roads: Practices for Resurfacing, Restoration and Rehabilitation," Special Report 214, 1987. 5. D. L. Ivey et al., "Safety in Construction Zones Where Pavement Edges and Drop Offs Exist," Transportation Research Record 1163, 1988. 6. American Association of State Highway Officials, "A Policy on Geometric Design of Rural Highways," 1965. 7. American Association of State Highway Officials, "A Policy on Geometric Design of Rural Highways," 1954. 8. Federal Highway Administration. "Handbook of Highway Safety Design and Operating Practices." 1968, 1973 and 1978 eds. 9. Federal Highway Administration,"Maintenance and Highway Safety Handbook," 1977. 10. Federal Highway Administration, "Traffic Control Devices Handbook, 1983, 2001." 11. American Association of State Highway and Transportation Officials, "Roadside Design Guide," 1989, 1996, 2001. 12. R. A. Zimmer and D. L. Ivey, "Pavement Edges and Vehicle Stability: A Basis for Maintenance Guidelines," Texas Transportation Institute, 1982. 13. John C. Glennon, "Roadway Safety and Tort Liability", Lawyer and Judges Publishing Co., 2004. Available from www.criterionpress.com. 14. Criterion Press, "Excerpts of Key Documents Related to Pavement Edge Drop-Offs," 2000. Available from www.criterionpress.com. 15. D. L. Ivey and L. I. Griffin, "Driver/Vehicle Reaction to Road Surface Discontinuities and Failures," 16th Congress of the International Federation of the Societies of Automotive Engineers, Tokyo, Japan, 1976. 16. E. F. Nordlin, et al., "The Effect of Longitudinal Edge of Paved Surface Drop-off on Vehicle Stability," California Department of Transportation, 1976. 17. R. H. Klein, W. A. Johnson and H. T. Szostak, "Influence of Road Disturbances on Vehicle Handling," National Highway Traffic Safety Administration, 1977. 18. D. L. Ivey and D. L. Sicking, "The Influence of Pavement Edge and Shoulder Characteristics on Vehicle Handling and Stability," Transportation Research Record 1084, 1986. 19. J. B. Humphreys and J. A. Parham, "The Elimination or Mitigation of Hazards Associated with Pavement Edge Drop-Offs During Roadway Resurfacing," AAA Foundation for Traffic Safety, 1994. 20. L. I. Griffin, "Accident Data Relationships, The Influence of Roadway Surface Discontinuities on Safety: A State-of-the-Art Report," Transportation Research Board, 1984. Available from www.criterionpress.com. 21. D. L. Ivey et al., "Pavement Edges, The Influence of Roadway Surface Discontinuities on Safety: A State-of-the-Art Report," Transportation Research Board, 1988. Available from www.criterionpress.com. 4. Common Topics in Roadway Defect Cases. 5. Roadway and Traffic Safety References.